It was November, and it was the first time I'd been back to the Norfolk coast since the summer. 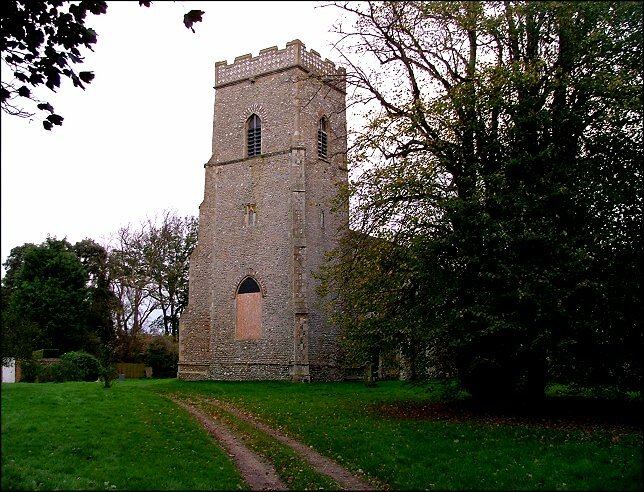 John Salmon and I had been exploring churches south of Holt, and now we headed north, through the heaths and woods in the gathering dusk. It was only a little after three o'clock, but already the daylight was failing, and then we came to St Mary, and just managed to catch the exterior before the light had gone altogether. St Mary has a big, blockish tower, ordinarily impressive; but the effect was spoilt somewhat by the west window currently undergoing restoration. 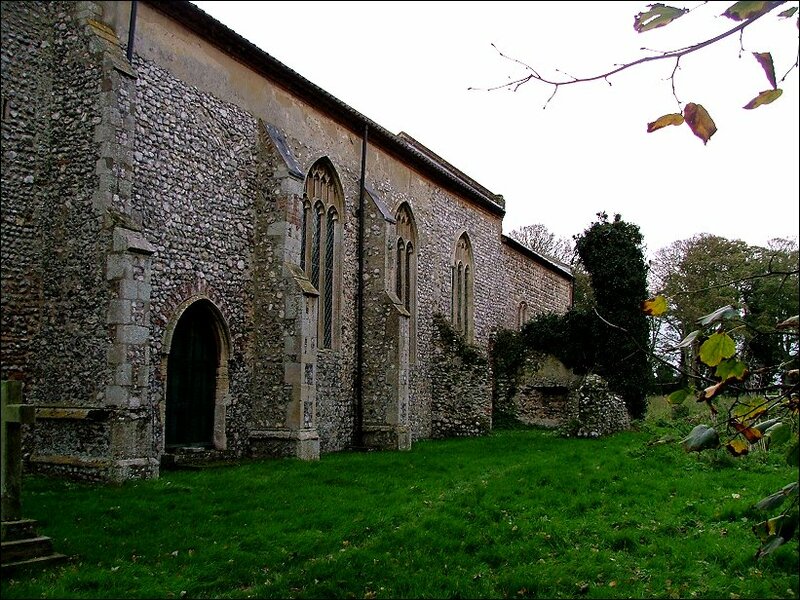 This was a cruciform church, the south transept now in ruins, but that to the north still in existence. 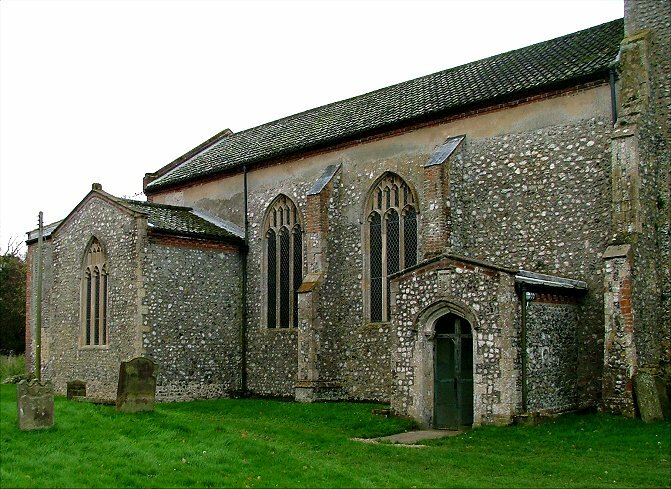 The church sprawls pleasingly in the open graveyard, and the way that the gardens of houses back on to it give the place a secretive, proprietorial feel. It was the perfect time of day and year to come upon such a church. The little porch leads into a big, open space. Given the light outside, I had expected the church to be fairly dim inside, but it was darker even than I had expected. 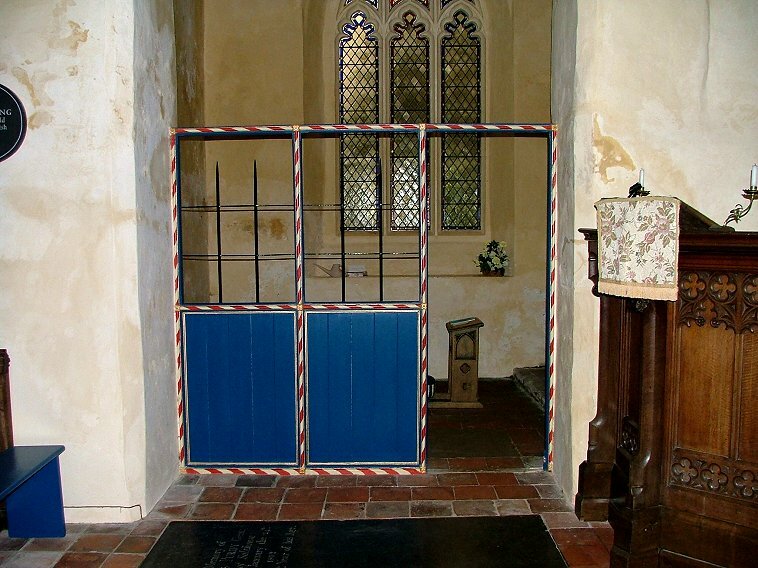 John knew where the light switches were, which was just as well, because St Mary is unusual in having one of the smallest east windows of any church in Norfolk. Given that the west window was boarded up, it might as well have been the middle of the night inside. 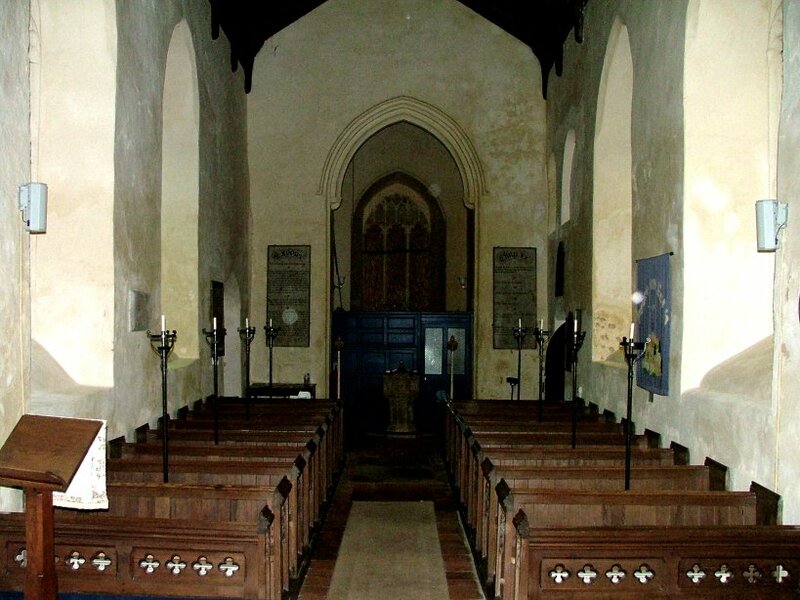 And it would be a shame not to see the interior of St Mary, because it is lovely, and there are some items of great interest. 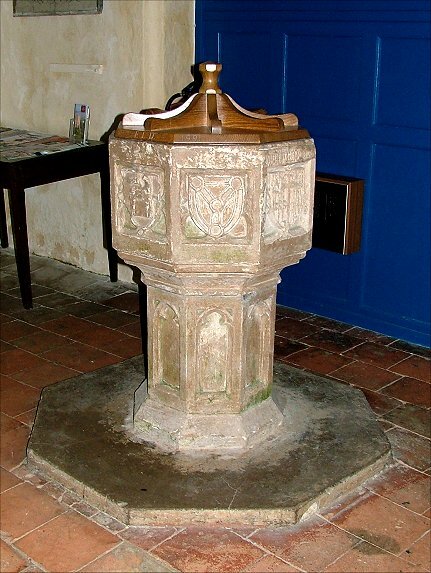 The 15th century font not only has a shield with an undamaged symbol of the Holy Trinity, but a dedicatory inscription to the de Kelling family in a very unusual place, around the rim of the bowl. The west end around it is cleared of clutter, which always looks good. 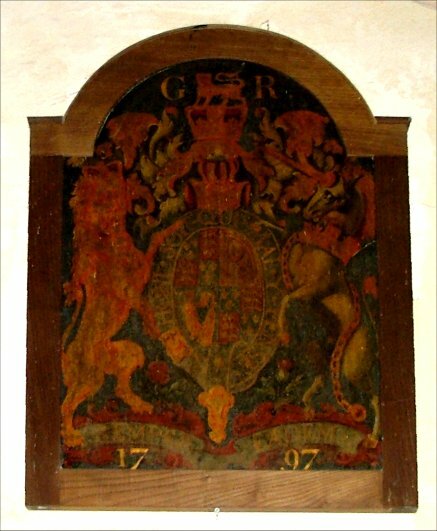 Up on the wall, the royal arms are dated 1797, which would make them those of George III. 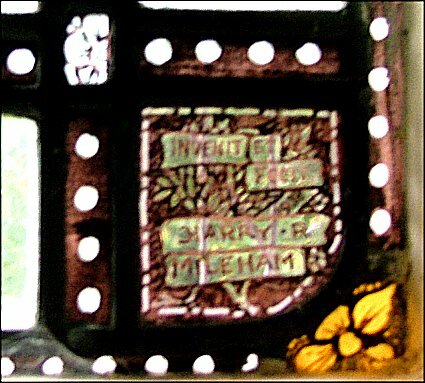 However, the initials at the top say simply GR, suggesting George I. 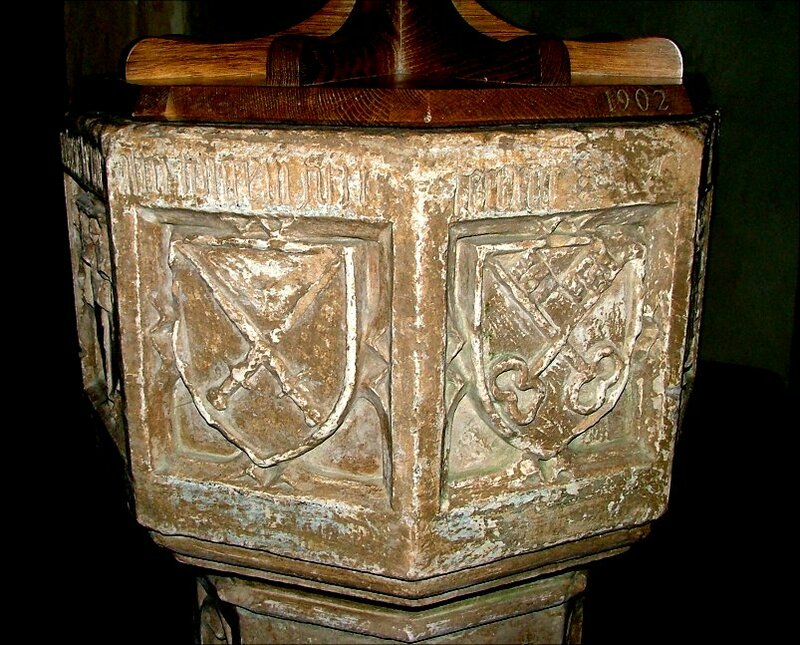 In fact, they are even earlier; the inscription Semper Eadem shows that they are the arms of Queen Anne, reused and adapted accordingly over the years. 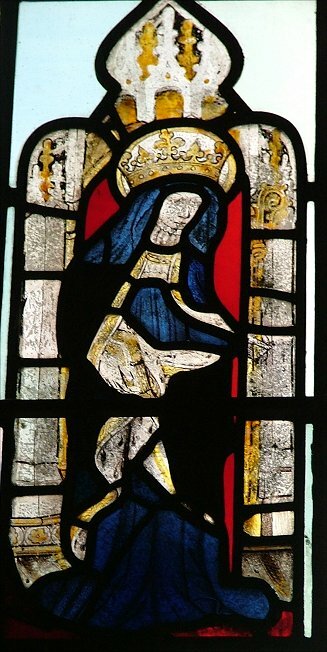 Moving eastwards, there are some 15th century glass figures of women reset in clear backgrounds. 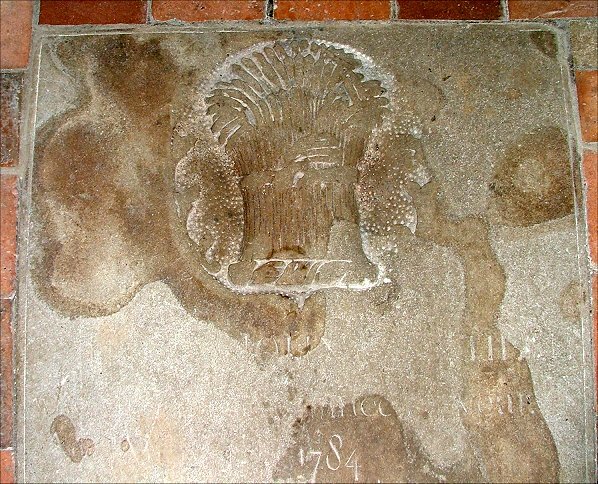 Two of them appear to be nuns wearing crowns, in which case one (or both) may be St Etheldreda, although I have a sneaking suspicion that they may be composites. A third wears a crown and is seated on a throne, suggesting that it may be part of a Coronation of the Queen of Heaven scene. 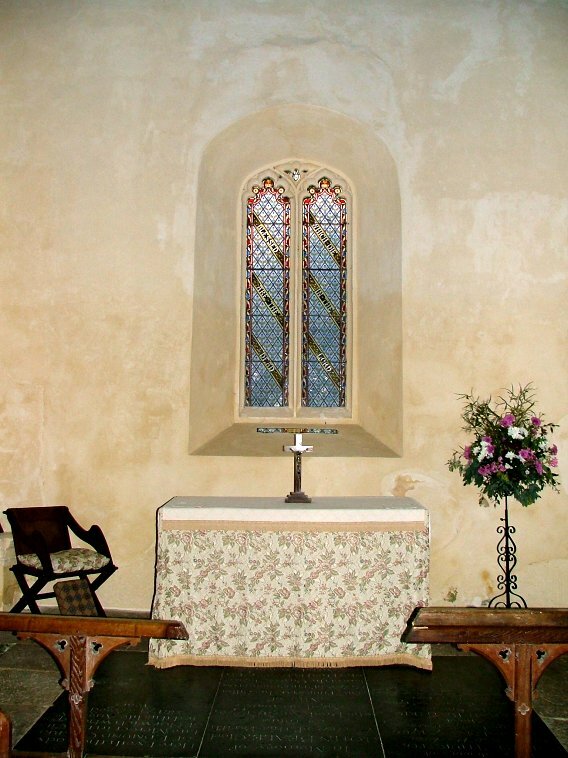 There is a pretty screen across the north transept, with a little Marian altar on the windowless east wall. As with the whole church, it is simple yet devotional. 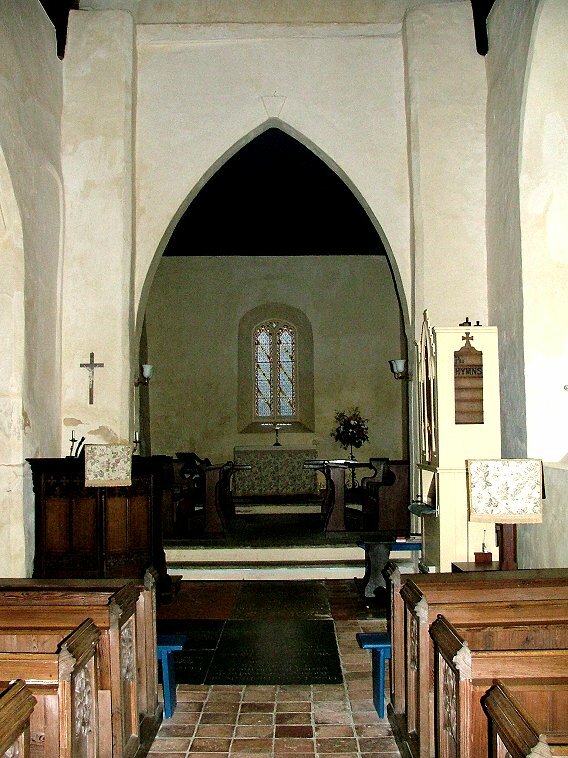 The arch into the south transept is still discernible, but the most curious part of the crossing is the chancel arch, a deeply cut pointed affair. 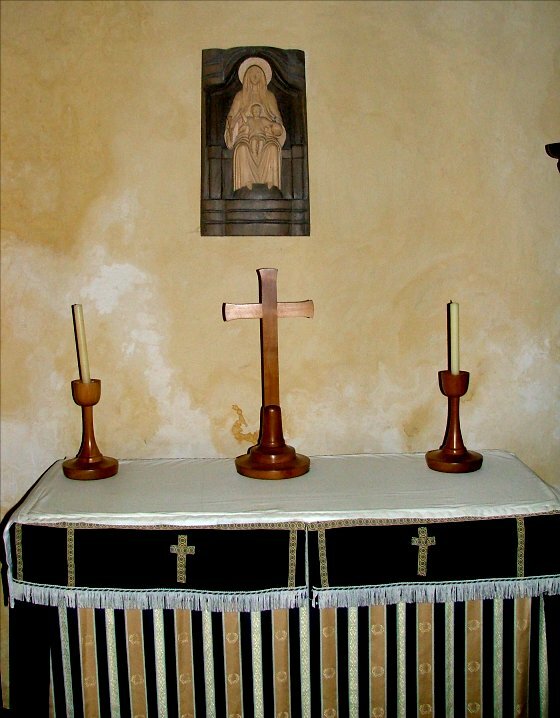 Beyond, the chancel is darker, the tiny two light window a contrast with the vast Victorian lights you find in some smaller churches. 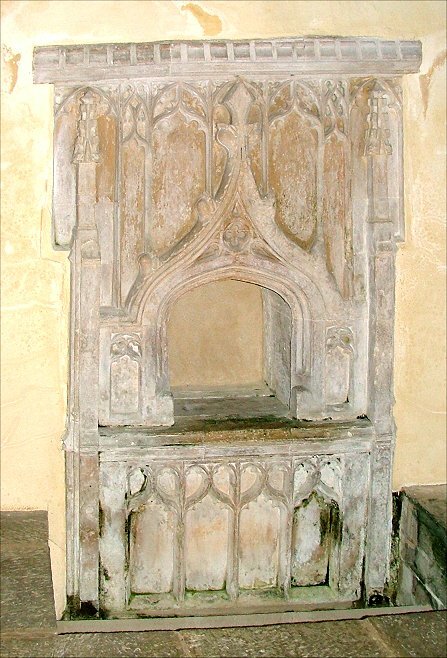 Here in the chancel is Kelling's greatest treasure, the Easter Sepulchre, an exquisite thing of the early 14th century. Its lower portion was for many years hidden by the raised Victorian floor, but as the Millennium project here the area around it has been lowered, and you can see it in all its glory. 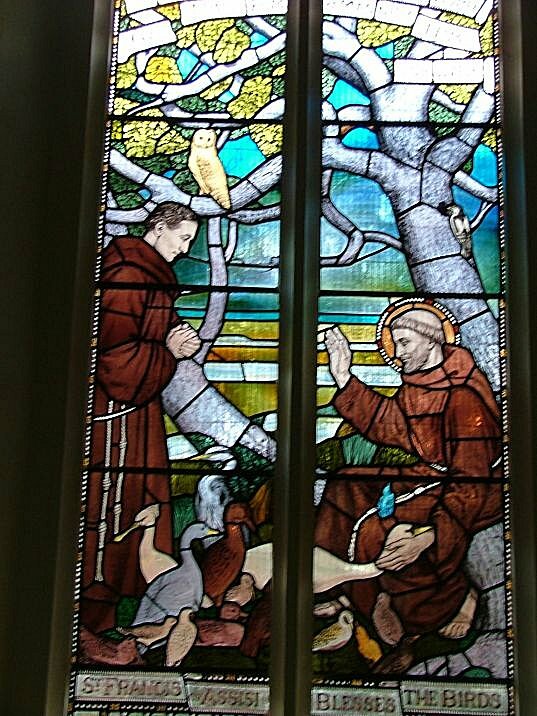 Coming back into the nave, the lovely window of St Francis blessing the birds was invenit et fecit (designed and made) by Harry Mileham, and don't miss the ledger stone that, instead of a morbid skull and cross bones or pompous heraldic shield, has a large sheaf of corn in relief. I thought that this just about summed up this lovely church.